jucunda var. viridiflora seed ? From BCR... "Mature rosette to 22cms. diameter x 20cms. high. Grey-green scurfed, channelled leaves. Arching spike to 10cms. 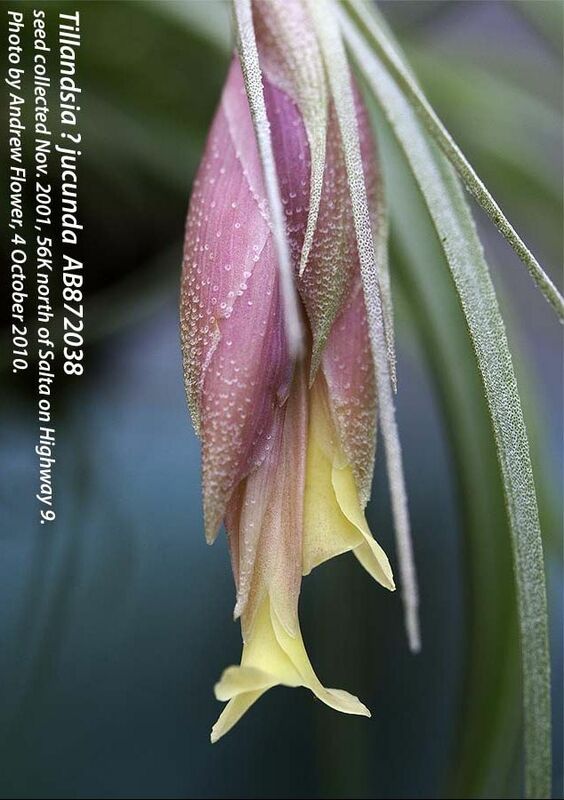 long, with trichome-laden mid-pink scape bracts and yellow flowers. The breeder (or seed supplier) is unknown. 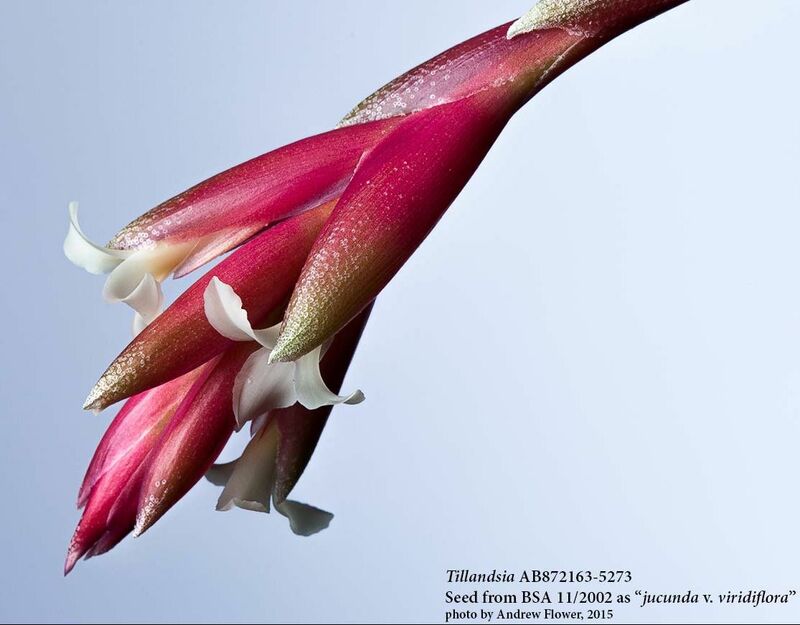 Notes from the seed raiser Andrew Flower (New Zealand): "Ex Bromeliad Society of Australia Seedbank, Nov. 2002, labelled T. jucunda var. viridiflora [now T. ixioides ssp. viridiflora (Rauh) Gouda 2010]. Since the 'Aussie Gold' population has always had strong yellow/gold petals, the appelation "viridiflora" is inappropriate. 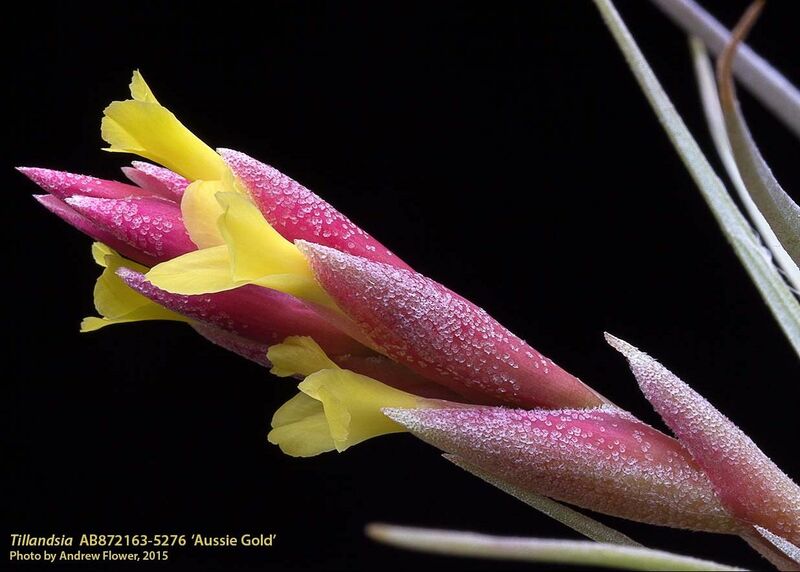 The size of the floral bracts in particular place this plant closer to T. ixioides whereas the bract colour is not at all typical of that species ! . So it seems to fall somewhere in between jucunda and ixioides and may be a hybrid. " Reg. Doc. 3/2015 by A Flower." Ed. ... Seed likely to have come from Ken Woods who ran the BSA seed bank at the time. His plant is shown on T. jucunda var. viridiflora page, this site. 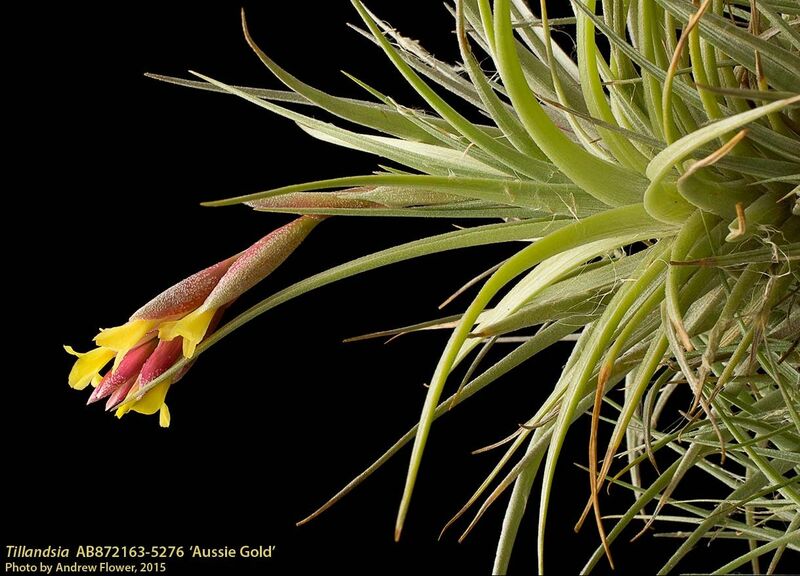 Andrew Flower ... "Judging from seedlings flowering here at present, anybody who has been growing seed labelled "Tillandsia jucunda v. viridiflora" received from the BSA seedbank in late 2002 is in for a surprise. Or two. Early flowerings here from this batch (see above) have golden yellow leaves. (var. viridiflora has green leaves). (1) T. jucunda var. viridiflora is now claimed to be, in fact, T. ixioides subsp. viridiflora (Rauh) Gouda 2010. SO at best they'd be an ixioides not a jucunda. (2) Plants from the seedbank aren't a "viridiflora" anyway, since they don't have green leaves. (3) These plants are not consistent with what I take to be T. jucunda - see pic of one grown from seed I collected near Salta, NW Argentina. Fools's Gold? Along came AB872163-5273 (see pic. above which can speak for itself!). Before they start flowering I don't knowingly sell plants from seedling batches that are possible crosses, or come from external sources that I am unsure of (not being one of those nurserymen whom Uncle Derek loves to diss :-) ). In the case of this particular batch of "jucunda v. viridiflora" seedlings, I now have to label each seedling individuallly and segregate out those that are consistent with 'Aussie Gold,' with the intent of selling their offsets in due course. Time will tell what has been going on with the batch - they may be a second generation hybrid (there are visions of recurvifolia being involved?) maybe seeds got mixed up at the BSA seedbank, or by me when I sowed them, it could be that different ovaries in one flower were pollinated by different daddies: its unlikely we could ever figure that out definitively. So there you go - just as well I waited 13 years before distributing incorrectly named seedlings!"